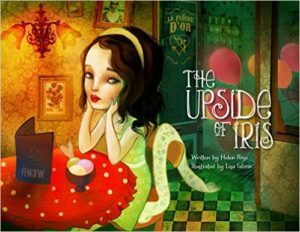 The Upside of Iris by Helen Rose and illustrated by Lisa Falzon has been on my list of books to review for awhile now. I got a little too book-happy and agreed to review several all at the same time. I never forgot about this one, but I’m sad that I didn’t take a look at it sooner! For young Iris,the whole world looks upside down, and the only person who truly understands and appreciates her perspective is her new friend Charlie, who has his own unique trait:he cannot speak. His silence, her precociousness, and their acceptance of each other make the two a perfect match. But happiness is fleeting,as Iris’s new stepsisters, skeptical and jealous (as conventional folks often are of those who dare to swim against the tide), manage to drive the two apart. Iris and Charlie are separated for the remainder of childhood. Still, before she decides to give up hope altogether, she decides to do one small thing for the other lonely souls around her…with wonderful consequences. The illustrations in this book are just amazing! And I believe the pictures themselves could probably tell the story, even without words. I think it would make a great animated short film. It is definitely a quick read, but one you could definitely read over and over. Though it is illustrated, I would not say that this story is solely for children. In fact, the story might go over the heads of some younger children. Though I could see myself as a child enjoying it, but I was a bit of a strange kid. 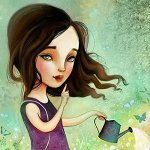 The love story is adorable, and the book also focuses on how children that are little different than others can feel out of place but eventually find their true self. Just an FYI, due to the amazing illustrations, the file size on this book is a little large, but definitely worth the space. I was provided an e-book copy of this by Kate Tilton Book Bloggers and author Helen Rose in exchange for an honest review. All opinions are my own.